Are you ready for Fall yet? Well, you might with these Cinnamon and Sticky Buns, courtesy of the Daring Bakers, September edition. If I were you I would trust the numerous other Daring Bakers out there (over 100 by now), tempting you with pictures of gooey goodness and telling you how wonderful and soft these are. If anything, trust me: I have made them 4 times since the recipe was announced by Marce from Pip In The City, our hostess this month. Each month takes on a different aspect as far as the challenges and recipes are concerned. Sometimes, it is the challenge of coordinating schedules, sometimes it is trying to be creative with presentation or design, this time it was just difficult to keep them around long enough to share, let alone take pictures! Everything about this recipe from Peter Reinhart’s The Bread Baker´s Apprentice made me want to make it again and again. Lisa got us started on a comical note as poor lady was suffering tremendously from her back and made the buns within the first week of September while high on painkillers. I expect her post to draw tears from my eyes, but her experience seriously made me crave sticky buns and cinnamon rolls. I made my first batch a couple of days later, in the evening, with the intention to photograph them in the morning and bring some to the neighbors before. When I got up, my husband was long gone…so was my tray of walnut sticky buns when they should have been awaiting their photo shoot! I thought that by no, he would now the rules of baking/blogging: don’t take any, don’t give any, don’t hide any until it has been photographed…nope! I got a sweet note form one of his students a few days later “Thank you Mrs. Tartelette, the sticky buns were delicious and it was great to start the day like this…” Well, I wish I had been there too!! Now, you understand my challenge this month…but it deter me to make them again and again. I froze the cinnamon buns and proceeded to make the buns, this time with cranberries and pistachios. Probably my favorite combo of nuts/berries and it worked really well taste wise and packed a punch of visual appeal when I served them to my parents for brunch a couple of weeks ago. 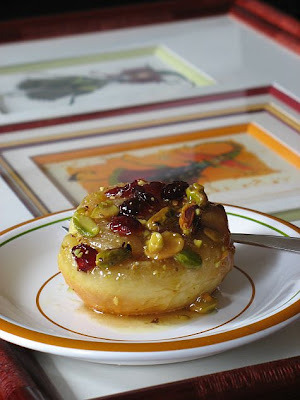 I changed the filling to cardamom instead of cinnamon a few times and it was jsut out of this world. 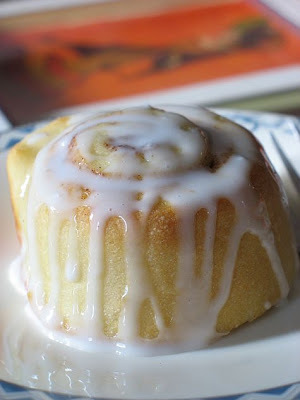 We all loved the buttery goodness, (well, that’s a given with one pound of butter in the caramel part), the moistness of the dough and all the cinnamon flavor we tasted with every bite. I found that there was more than enough cinnamon sugar (used inside the rolls and buns) as well as powdered sugar glaze for the rolls. Turned out B. adds glaze as he eats away so if our mate is anything like mine, who knows?!! Making the Dough: Cream together the sugar, salt, and shortening or butter on medium-high speed in an electric mixer with a paddle attachment (or use a large metal spoon and mixing bowl and do it by hand). Fermentation: Ferment at room temperature for approximately 2 hours, or until the dough doubles in size. Proof the Buns: Proof at room temperature for 75 to 90 minutes, or until the pieces have grown into one another and have nearly doubled in size. You may also retard the shaped buns in the refrigerator for up to 2 days, pulling the pans out of the refrigerator 3 to 4 hours before baking to allow the dough to proof. I might make another batch before this coming week is over! Thanks Marce for picking up such a recipe. Thanks Lisa and Ivonne, founders of the Daring Bakers, for managing this wonderful group with such gusto and taste. 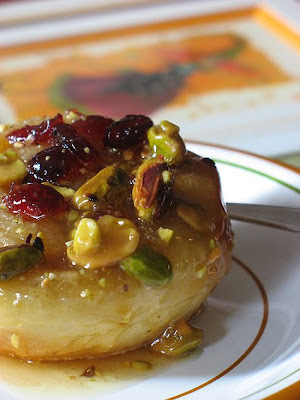 Check the blogroll to read more sticky goodness! 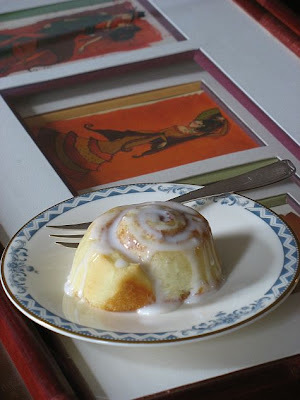 I was lucky enough to photograph the buns and rolls on pictures framed by my mom. See, her talent is that she is a framing artist. My dad paints watercolors and that’s how she got started, she took classes to be able to display his work. After many years, the class became more of a group of friends, challenging themselves with new techniques. Last year I ordered a set of prints from a French artist, Anne-Soline, 3 fairies and 3 dancers, and she brought them over this trip, double bubble-wrapped. They made it one piece, which enabled me to play around with the layout of the pictures.
" 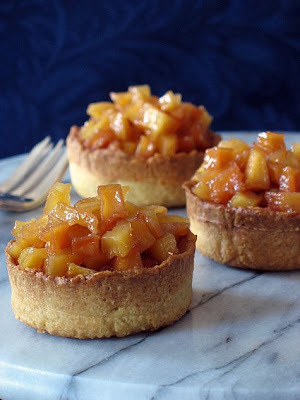 Chaos"... that's the word that comes to my mind when I think about these little tarts. They are not difficult to make, although they will take you some time if you make everything from scratch, but the results are really worth the effort. What I meant by "chaos" is all the noise, movements, tribulations that took place around them while they were getting their shiny coats and lemon dots. I decided to make my tarts for Hay Hay It's Donna Day, created by Barbara of Winos and Foodies and hosted this month by Sarina of TriniGourmet this past tuesday. My day was pretty skimpy on training appointments so I figured I would have ample time to make these and a couple of other pastries for orders. I started with the dough right before I left for work, inspired by one that did the rounds of the French bloggsophere last year. A sort of easy and fast mock puff pastry, which originaly calls for "petits suisses" as a moisture source but I'll say "hot dang!" (because I love them) the day I find those here, so I subbed sour cream and everything worked out fine. Once back home, the dough got a little resting time on the countertop before being tooled out. Smooth as a baby’s bottom and soft as a pillow I almost wished our rolling time would have to come to an end in a pie plate…Have you ever kneaded a bread dough or other that was so nice to you, so pliable that you wish you could do it forever?...Ok, if it wasn’t official before, now you can definitely see how weird I can be about my doughs! Anyway, I disgress…I was about to fill my mini pie pans when I heard kids’ voices in the garage. Our neighbors’ twins were down there figuring a way to get in the middle if the action with B. You bet, for two 7 year-old boys, our garage is like a treasure cave of trouble to get into with tools galore, boating equipment, golf clubs, crab and shrimp nests, etc….They are so bubbly, it sounded like there were 6 kids playing around. 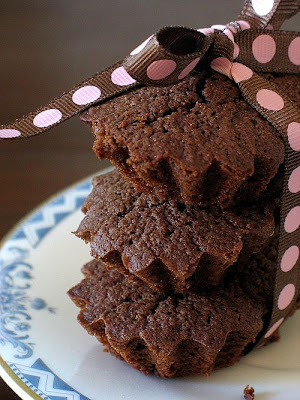 My dear husband sent them upstairs to get some water and a treat and that’s when chaos ensued…I love baking with children, I think their take on things is honest and down to earth. They are also very creative and bring good ideas to the table when it comes to ease of preparation and decorations. If you are calm enough to understand that within 10 minutes your kitchen is going to be splaterred with flour, sugar and your utensils flying in every directions, then you are going to have a serious good time! 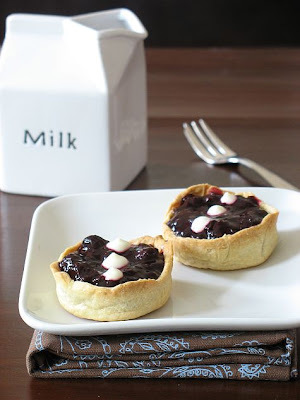 One of the boys looked at the shells filled with the almond filling coming out of the oven and started to blow on them so they would cool faster and they’d be able to fill them with the blueberry compote. They even suggested holding them over the AC vent for quicker cool down time, not practical but smart for sure! Once filled with the blueberry compore, the twins proceeded to help me out with dotting the tarts with lemon curd cream. I believe they were quite proud to get about one cup in the pastry bag and not on their shoes. The dots were another story... The three photographed tarts are actually the ok looking ones, the others much ressemble the surfaces of Mars and the Moon, and I even recall one tart attempted to smile. They ate 3 mini ones right then on the spot, too happy to show my husband their blue tongues! Within the nest couple of days, the tarts kept disappearing at great speed, so much so that I think I only ate one... not fair! The recipe given by Sarina to illustrate this month "Tarts" theme starts with a puff pastry and I wanted to keep with this idea but was pressed for time visiting with the parents so I tried this quick puff pastry I mentioned above. 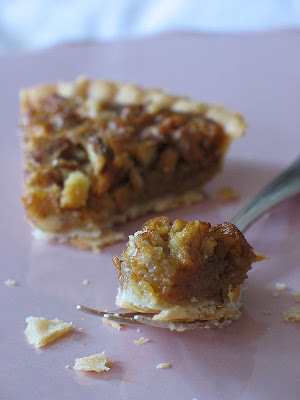 The filling is my "go-to" frangipane (almond cream) filling that I used last month with fresh figs. The blueberry compote is nothing else than cooked down fresh picked blueberries (there is a patch 15 minutes down the road), and the lemon curd is leftover from the Meyer lemon curd I made for a Ricotta Cake and that I had in the freezer. All the parts can come together over several days, so there is no feeling of waiting or rushing if you spread the work over 2-3 days. You can also keep everything unbaked for 3-4 days. While talking to Veronica a couple of weeks ago about the Meyer lemons Mary had sent us, I was talking to her about possible uses and tart options for HHDD. As it happens when most cooks and bakers talk together the conversation quickly moved from "lemon and blueberry tarts" to "Meyer lemon curd, blueberry compote on frangipane cream in mini shells"...I can see how a simple Sunday dinner could turn into a New Year's Eve Party. I exagerate of course, but you get the point. Thanks Veronica for the tasty brainstorming! Process all the ingredients in a food processor until the dough comes together. Remove and knead a couple of times until smooth. Roll out and fold in three like a business letter. Repeat a couple of times and refrigerate for 20 minutes. Roll the dough and fit into pie shells of different sorts or one large 12 inch one. Blind bake for 10 minutes at 350F. Let cool. Finely grind almonds with sugar in processor. Add egg, butter and 2 teaspoons rum. Process until batter forms. Pour filling into crust. Bake for 15 minutes at 350F. Let cool completely. In a heavy saucepan, combine all the ingredients and heat over medium until the blueberries release their juices and the whole mix start to thicken, about 10 minutes. Let cool to room temperature. Combine the zest, sugar, juice in a saucepan, and bring to a simmer. In a small bowl, beat the eggs until light.Beat some of the lemon mixture into the eggs to temper. Scrape the mixture back into the saucepan and cook stirring constantly until it thickens up, about 5 minutes. Meanwhile, heat the gelatin in the microwave until dissolved, about 30 seconds. Remove the curd from the heat, let cool completely. Gently fold in the whipped cream. 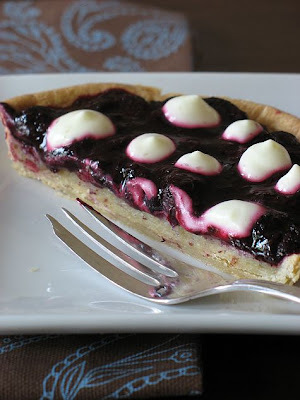 Spoon the blueberry filling into the tart or divide evenly among the mini ones. Pour the lemon curd cream into a pastry bags and dot the blueberry filling with it. The combinations of all the flavors is truly outstanding. Just plenty to make it sweet and just enough of a little pucker with the lemon. I have to warn you guys that you may have to wait longer than a couple of days in between my post for the next month. My parents are visiting from France and staying until the middle of October. I already employed mom tonight to help me out in the kitchen while I could work on a couple of pastry projects and dad is in charge of hopping in the car in case we need something last minute from the grocery store. They have been here so many times before (14) that within a couple of days they had found their marks. Mom even exclaimed as soon as she got in the house "it's good to be home", which made me beam with joy, of course. I hope you will understand if I don't post too often, we have a few things planned (dad is a General after all), but a lot will be left to the weather and the temperatures (pretty hot and muggy right now). Where am I going with this paragraph, those pictures and that title? Well, when I received Mary's box of Meyer lemons, I was on the phone with mom and I had to spend the next 10 minutes explaining her about that group of wonderful people I knew and how we sometimes exchange much more than comments on our blogs, as well as trying to describe to her a Meyer lemon as I was cutting one open. She made me promise to save her some cake "or something"...Well between B., the neighbors and me, there was no cake left within a couple of days but there was plenty of lemons for another batch of curd. 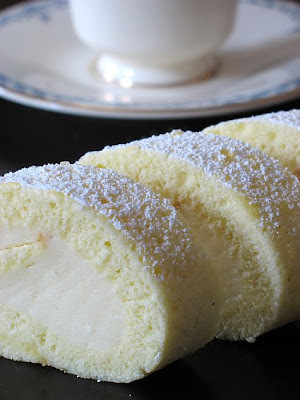 Since my parents were visiting, I decided to make my dad one of his favorites, a jelly roll cake, but with Pierre Herme's signature lemon cream inside instead of jam or preserves. 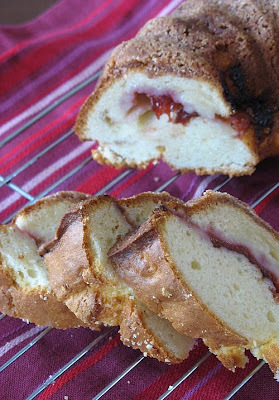 My paternal grandmother passed away when I was 4 so I never got the chance to share baking time in the kitchen with her (unlike my "mamie Paulette"), but I have always heard about her "strawberry jelly roll cake" and the way my dad closes his eyes when he reminisces about it is a pretty good indication it had to be something! Mary's lemons went a long away in satisfying both my family both native and French. Now let's really talk business: that Herme's lemon cream...boy oh boy! Since I last made it, it must be on regular supply at the house, and we think as highly of it as we do Nutella. We put it on everything, mix it with everything. Some people, and I was too at first, are concerned, afraid, surprised at the amount of butter that goes into it, but let me tell you that it is absolutely worth and the magic of pastry is that you forget about how much there actually is once you put that spoon to your mouth....you're hooked...you want more... This time around though I reduced the amount of butter as I was adding gelatin for a firmer hold inside the cake roll. For the cake itself, I used another one of Herme's recipe, from a book my mom brought me this trip and that I am already devouring (no pun intended). Nothing fancy about it, it is a plain sponge cake but I added grapefruit zest and a dash of almond extract, as I love the two together. In a microwave safe container, melt the butter. Set aside. In a medium bowl, whisk the eggs, almond extract and the sugar until pale and thick. Add the grapefruit zest. With an electric mixer, whisk the egg whites until stiff. Gently fold the whites and the flour, alternating, in the yolk/sugar mixture. Add the butter fold until incorporated. Spread the batter onto a parchment paper lined baking sheet. Bake for 10 minutes. Remove from the oven, let cool for 5 minutes, invert onto another sheet of parchment paper. Let cool. 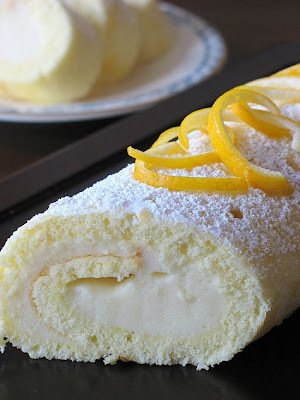 Fill the cake with the lemon cream and roll. Dust with powdered sugar and serve. Cook the mixture over the water bath, whisking constantly until the cream reaches 180 degrees. It can take up to 10 minutes. Once the cream reaches 180 (your whisk will leave ribbon tracks in the cream),remove the cream off the heat and put it into a blender, with the gelatin. Pulse a couple of times, until the gelatin dissolves. Let the cream cool to 140. Add in the butter and process until perfectly smooth. Pour into a container, cover and refrigerate until ready to use. Not to worry, this cake is only a mouthful in its pronounciation as it is actually neither dense nor dry, even after a few days parked in your fridge. I made it on friday morning before work and we left for the weekend (and a bad sunburn made me turn as red as a Strawberry Mirror Cake)to enjoy some alone time before my parents get here. When we got back tonight and wanted something to snack on after dinner, I pulled it out of the refrigerator and it was just as good as the first day. I have a bad weakness for coffee cake and I am always on the lookout for a good recipe. I see one I like just about everyday but when Belinda from What's Cooking in a Southern Kitchen posted this one, my tastebuds got excited again. I wanted to use one of the 9 jars of Plum-Meyer Lemon jam I had made after the Ricotta Cake instead and beside keeping the proportions of solid to liquid the same, I departed from the recipe and made it my own according to what I had in the fridge. Coffee cakes are like good friends: strong and familiar, present and comforting. You could use any combination of jam or marmelade that you want, but Sunny my market man gave me five pounds of Italian plums for only four dollars the other day and they got fast chopped up for jam! Since I wanted to use my Meyer lemons to their full capacity I kept the rinds of the ones used in the lemon curd for the ricotta cake and infused the jam with them. The flavor of the plum is now out of this world! 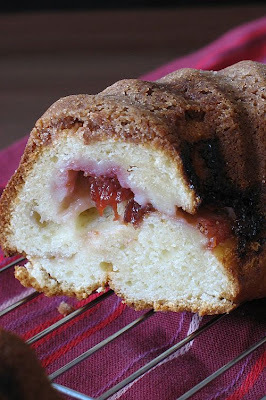 For the topping I added finely ground almonds to enhance the plum flavor in the middle of the cake. Where the recipe called for cream cheese I opted for mascarpone cheese. I also substituted buttermilk and sour cream for the milk as I had ran out of bakig powder and only used baking soda for the leavining agent which only works if used with a sour ingredient. Since I sometimes have a difficult time putting my best English forward, go read Veronica's post about it, she said ten times better than I would! I followed a basic jam making method from Christine Ferber (our French June Taylor): put together in a large pot (I use a big Dutch oven) same weight of fruit to sugar, juice and zest of 4 lemons (I used the rinds of mine) and a vanilla bean. Bring to a summer, turn off the heat, cover the top with parchement paper and refrigerate overnight. The next day, take off the parchement paper, bring the mixture to a boil and let it cook for 5-10 minutes. Skim the top foam if necessary. Laddle in sterilized jar, cover with the lids. Submerge the cans in boiling water for 10-25 minutes, remove and let cool. If the top pops while they are cooling, you have canned them properly, if not, refrigerate and use within the week. The only problem with the cake? I think I already ate too much of it to have enough left to share with my parents...Well darn, I'll have to make more...hehehe! 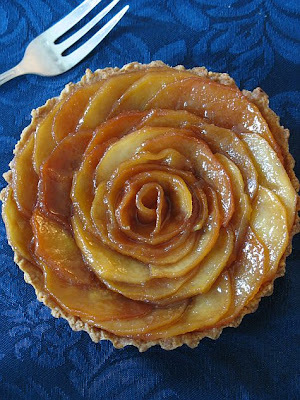 Combine first 4 ingredients; cut in butter with a pastry blender until mixture is crumbly. Sprinkle in a greased and floured 12-cup Bundt pan; set aside. Beat mascarpone cheese, butter and sugar at medium speed with an electric mixer until creamy. Add eggs, one at a time, beating well after each addition. Combine flour and baking soda, add to the mascarpone cheese mixture alternately with the buttermilk and sour cream, beginning and ending with the flour mixture. Spoon half of batter into prepared pan, spoon jam over batter, being careful not to allow the jam to touch the sides of the pan, top with the remaining batter. Bake at 350 degrees F. for about an hour or until cake tests done. Cool in pan on a wire rack for ten minutes; remove from pan, and cool on wire rack. Over the summer, Mary wrote several posts and shared recipes with Meyer lemons, each more tempting than the next. What started on my part as an innocent "I wish I could find Meyer lemons here" became a tortured "Mary, please send me some, I'll pay for shipping!". Believe me, I searched everywhere in town for the coveted lemon and nothing...people would even give me the odd "why is it so important?". Well, if you have been reading this blog for a while you know by now how much I love anything and everything lemon, sour, tart, tangy and if bloggers on the west coast keep waxing poetic about the fragrant Meyer lemon, then I need to know what one tastes like. Well, the postman rang the doorbell the other day handing B. a pretty heavy box and he exclaimed "It's for you! From California"....Oh gosh, did I make a Recchiuti purchase in my sleep? Did I sleep walk to the computer and ordered Banana Cream Pie from Tartine?...No peeps...even better: Mary had sent me a box full of Meyer lemons! My eyes grew bigger, my tastebuds all awaken by the fragrance coming out from under the newpaper padding. I am aware that we all make food discoveries throughout our life but when you are of age to really enjoy what is under your nose, the experience is quite intoxicating. I have never had a lemon that tasted like a sour clementine with a faint smell of cardamom before. I am sure others will find that funny, but yes, I smell that spice everytime I bring one of those lemons to my nose...and it makes me happy! I received Mary's gift on friday and I have already put them to good use, not only with this cake, but in a batch of plum jam where I used the rinds to flavor the preserve, in sauces, ice creams and other cakes...just to give you a preview of things to come. 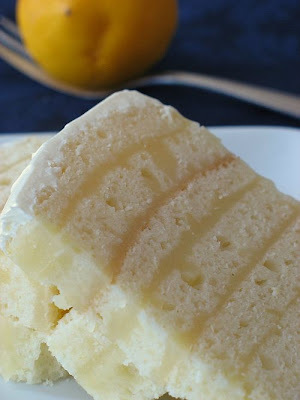 I was craving my beloved yogurt cake sunday afternoon but I wanted to try another recipe, something of the same substance but that would allow me to use the Meyer lemons as well as other ingredients. 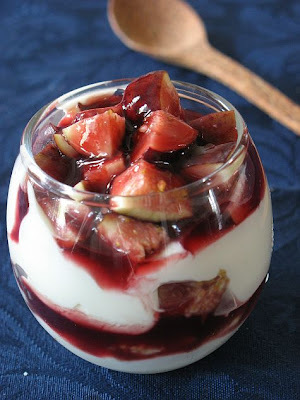 I was thinking ricotta instead of yogurt, and before following my usual recipe I decided to browse the web. Boy am I glad I did! I think I spent over an hour on both Sigrid's blogs, looking at her magnificient photography and pretending to speak Italian fluently (!) 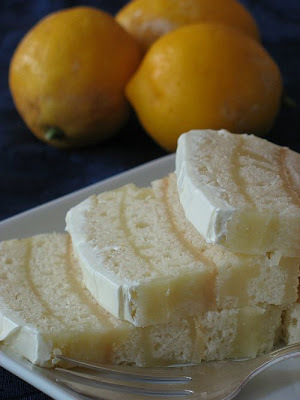 and stumbled upon a recipe for a lemon ricotta cake from the sardinia region of Italy. Bingo! Fate!Kismet! or whatever else you find appropriate. I did not change much but reduce the sugar a bit. I also baked the cake in a rectangular pan and cut it in 5 long pieces, cut these in 3 separate layers and layered them with a light lemon curd filling(no butter in the cake or the curd). Perfect for an afternoon tea. I have to say that this is one of the desserts that never made it to the neighbors: I cut and froze slices so I could savour my precious loot for special times. You know, when you feel like bringing a friend closer to you although they are miles away, like tonight. Mary, thank you. I truly hope that one day our paths do cross, in the kitchen and around a homemade meal. Yes folks, I have a wonderful friend, and I have never met her. In a large bowl, combine the ricotta and sugar. Add the egg yolks, the lemon juice and zest, then the flour and baking powder. In the bowl of an electric mixer, whip the egg whites until stiff and getly incorporate them to the egg/flour batter. Butter and flour a 13x9 inch baking pan and pour in the batter. Bake for 40 minutes or when a toothpick inserted in the middle come out clean. Let cool completely. Divide the cake in three lenghtwise and 5 crosswise. (you may have leftover slices...just eat them plain or with a touch of jam). In a large loaf cake pan line with plastic wrap, layer slices of cake and Meyer lemon curd. Refrigerate. Slice and eat when you are ready! In a small bowl, beat the eggs until light.Beat some of the lemon mixture into the eggs to temper. Scrape the mixture back into the saucepan and cook stirring constantly until it thickens up, about 5 minutes. Meanwhile, heat the gelatin in the microwave until dissolved, about 30 seconds. Remove the curd from the heat, stir in the gelatin and whisk until well incorporated. Let cool to room temp and use to fill the cake. Strain and refrigerate, covered with plastic wrap until ready to use. Update: I realize I forgot to tell you what I used on top of the cake. I took about /2 cup to 3/4 of mascarpone and mixed in some honey and iced the top with this. I have done similar cakes with sour cream or cream cheese instead, worked as well. I am nowhere close to Tartine Bakery in San Francisco and yet I get to have their Banana Cream Pie for dessert! Actually, it would be like going to Paris for a patisserie from my sugar daddy at that point! Except....one very generous blogger and friend, fellow Daring Baker, emailed Lisa and me one day saying she had an extra copy of Tartine and Balthazar and if we could decide which one we wanted she'd be happy to give them a new home. If I recall my email back was something along the line "I woul love the Tartine one, of it is okay with Lisa"..."please, please, please Lisa...." secretly crossing my fingers, hands and toes! As you can see I received the coveted one! Thank you Veronica...(and Lis!) I am enjoying it a lot and so is everyone else in the neighborhood! It took me a while to decide what to make first. Really, all their pies look gorgeous, the cakes and cookies sound all so mouth watering and the pastries would make anybody drool (be right back, I forgot to wipe page 149 !). Allright, so it's not the speediest of pies to make, especially of you make individual ones, but you will be rewarded by a table of well fed, content, and well sugared guests. 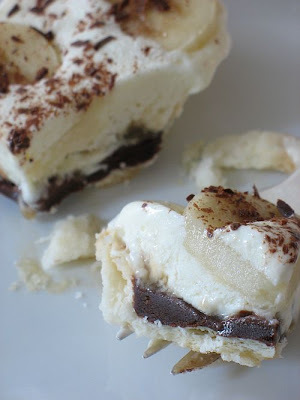 Just listen to this: flaky pie crust, layer of chocolate ganache, layer of caramel, pastry cream, bananas and if that was not enough a dollop of whipped cream! No pudding! No fake banana flavor! I did change a couple of things (sorry, can't help myself), that in my opinion only worked in its favor. Instead of the bakery's caramel sauce, I used my beloved salted butter caramel sauce, and skipped the extra whipped cream on top as the pastry cream makes it rich enough and I think it would have masked the banana flavor. From what I can tell no one missed it...you know you did something right when there is pure sweet silence at the table! 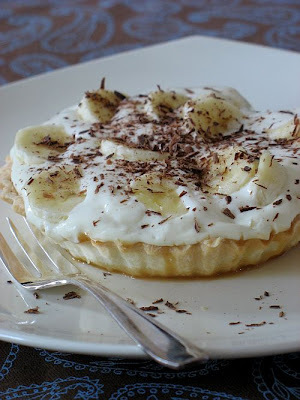 Banana Cream Pie, with caramel and chocolate, adapted from Tartine. In a small bowl, dissolve salt in water and keep cold. To make dough with a food processor: put flour in the work bowl, scatter butter over flour, and pulse until the mixture forms large crumbs, but some of the butter is the size of peas. Add salted water and pulse for several seconds, until the dough comes together as a ball, but is not completely smooth (you should see some butter chunks). On a floured surface, divide dough into two balls, shape into a 1-inch-thick disk, wrap in plastic wrap, and chill for at least 2 hours or up to overnight. To fill a 10 inch tart pan, roll out one disk on a lightly floured surface to 1/8 inch thick, rolling from the center toward the edge in all directions, lifting and rotating the dough a quarter turn every few strokes. Cut out a circle 1½ inches larger than the tart pan and carefully transfer dough round to the pan (folding in half, if necessary), easing it into the bottom and sides and pressing into place, and trim the edge with a knife.Line with parchment paper and pie weights or dry beans. Bake until the surface looks dry with no opaque areas left, about 20 minutes. Remove from oven and remove parchment and weights or beans and return shell to oven for another few minutes. If the center starts to rise, gently pierce with a knife tip. Let cool completely. Set the chocolate into a bowl. Heat the heavy cream to boiling point and pour over the chocolate. Let stand a couple of minutes an gently stir until fully incorporated and glossy. Cool to room temperature. Pour over the cooled pastry shell and refrigerate. In a heavy saucepan set over low heat, combine the sugar and water and heat just until the sugar is dissolved. Add the butter. Let it come to a boil and cook until it reaches a golden caramel color. Remove from the heat and add the cream ( it will splatter and get crazy, but do not fear and trust the recipe). Whisk to combine and put back on the stove. Let it come to a boil again over low heat and cook 10-15 minutes until you reach a nice creamy consistency. Let cool to room temperature.Pour over the cooled chocolate ganache and refrigerate. Heat the milk, vanilla seeds and salt in a pan and put over medium heat, and bring to a boil. In a large mixing bowl, whisk the sugar, cornstarch and eggs until smooth. Slowly add 1/2 of the milk mixture into the egg and whisk constantly to temper them. Add the remaining milk and return the whole thing to the saucepan. Cook until you get a thick consistency, whisking non-stop. Remove from heat and pour into a bowl, let cool for 10 minutes and then incorporate the butter, one tablespoon at a time, until smooth . Cover the surface with plastic wrap, directly touching the cream, let cool completely. Layer the pastry cream on top of the chocolate and caramel. Cut 2 ripe bananas in medium-thick slices (you know, not a mouthfull but not disintegrating when you pick it up), and arrange them over the cream, lightly pressing down. Decorate with chocolate shavings and if you really need it, some whipped cream. Ok...there is something else that makes me beam with joy beside the pie: I will be wearing the 3rd Brownie Babe apron very soon! 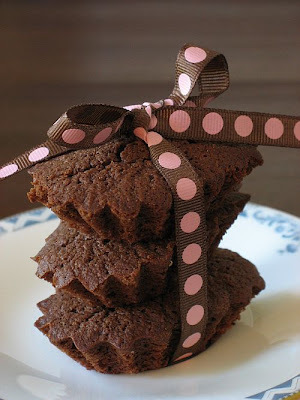 Go check Myriam's blogs for some seriously delicious brownies recipes. Wow! Just wow! There are so many incredible recipes I want to try soon, it is a great honor to be chosen among all these fine bakers. Ya'll went all out! I have to thank Guillemette and Loukoum for this one, I stumbled onto the Marbled Ricotta Cheesecake Brownies one day by accident and decide that my friends on this side of the pond ought to have the recipe too! I can hear you read the title "No Helen! 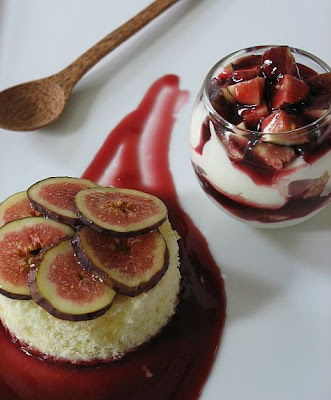 Not another Financier recipe....please!" I know, I know, I have made them plenty of time myself, I have also seen them successfully baked and talked about on other blogs, so why would I subject my house to the wonderful aromas of dark chocolate and almonds on a sunday afternoon? To help a reader in search of a good recipe, that's why... About a month ago, I received an email from A. asking me if I had a good recipe, easy enough for her to reproduce for dark chocolate financiers she had sampled at a local bakery and especially for a version in which the chocolate was not overpowering, but just "in the right amount". First, I felt very flattered that a reader would come out and ask for help (everyday somebody new comes out of lurkdom, and that is always appreciated). Then I thought I had the perfect excuse to bake and sample many variations of one of my favorite mini cakes as I don't lack financiers recipes. I could not tackle this project right away as I was entertaining a guest last month (and I have to admit, myself at the same time) and we had already decided on a few items to bake together. I decided that this past week was the perfect time to try different chocolate financiers recipe and finally nailing the one that had the perfect balance of chocolate to pastry. I know that everybody's taste vary greatly in that regard but I think I have achieved success and hope that A. likes the outcome as much as we did. I found a great recipe in a magazine I brought back from home this past Christmas and it was already adapted from Master Chocolatier Jean Paul Hevin. With such a source I felt confident to be steered in a good direction. Financiers are so easy to make, only the name makes them seem fancy. Not having the classic rectangular molds to make them (but they are on their way...thanks mom! 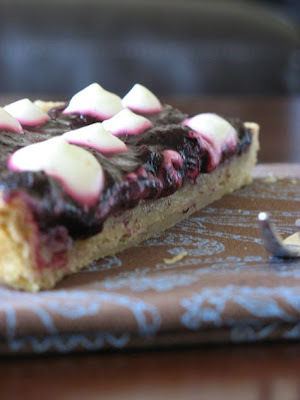 ), I used mini rectangular tart molds. Really people, do not hesitate making a recipe just because you do not have the "appropriate" or "classical" pans....what is more important?....Taste! Right! I also made a hapy discovery while baking and sampling various recipes. Financiers are traditionally made with ground almonds and somehow in the middle of all that baking frenzy, I ran out....well, I found out that ground graham crackers make a suitable substitute, (in the same quantity) when you are in that predicament. It is best to do everything by hand as you can control the folding of all the various ingredients better, and really it requires only a minimum of elbow grease. In a heavy bottom saucepan, heat the cream to boiling point, pour over the chocolate and let sit for 2 minutes. Gently stir to melt the chocolate and cream together until smooth. In a separate bowl, combine the powdered sugar, flour, ground almonds, baking powder. In a small bowl, beat the egg whites for a minute, just to break them up. Add them to the flour mixture carefully, before they are completely incorporated, add the melted butter. Finally, fold in the chocolate/cream mixture and fold until smooth. Divide the batter into the molds (preferably coated with cooking spray or buttered), and bake at 350F for 15 to 20 minutes, depending on your oven. Let cool 5 minutes before you unmold them. Well, the only issue I have with this recipe is that it does not make enough!!! So, A. I hope you get to try them soon and tell me what you think. I know, it seems very strange to put "baked" and "doughnuts" in the same sentence and then expect you to believe me when I say they were good...but they were! But why would I turn a completely good fried piece of Americana into a baked good? Well, for once I was curious to try another recipe after my first success last year. I also have the same reason as last year for trying baked doughnuts yet again. My parents are coming to visit for a while and they love waking up to the scent of nutmeg, cardamom, and cinnamon....and my dad can't resist the attraction of a good doughnut. However, they both have health issues that I have to take ito consideration when baking and cooking (heart and diabetes). Thus, the reason why I wanted to make a healthier version, and made this other version as a test run. 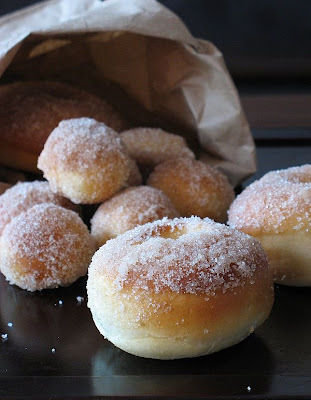 Looking online you will find dozens of recipes for baked doughnuts but how would you know if they are any good? Well, first you can always send me an email and I will force myslef to help you out and make a few batches, just to be on the safe side. On a more serious note, among all the interesting recipes I found online, I recognized two bloggers I had already followed in marbled chocolate cake goodness so I felt confident they would not stir me in a bad direction. One thing neither of us will tell you is that they "are exactly like doughnuts". 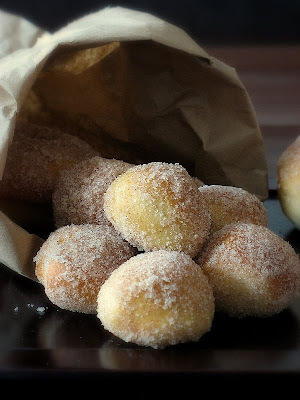 The obvious reason being that they are not frying involved and like my predecessors I went for the cinnamon sugar topping instead of a powdered sugar glaze....sounded lighter. The resulting treats were not as soft and buttery to the mouth as the ones you get at Krispy Kreme for example but they make a good substitute when the craving hits. They are a tad chewier and more like soft pillows of dough but they were quickly devoured by our guests sunday morning, which is always a good sign. Place 1/3 cup of the warm milk in the bowl of an electric mixer. Stir in the yeast and sugar and set aside for five minutes or so to let it proof. Stir the butter into the remaining cup of warm milk and add it to the yeast mixture. With a fork, stir in the eggs, flour, nutmeg, and salt - just until the flour is incorporated. With the dough hook attachment of your mixer beat the dough for a few minutes at medium speed. Adjust the dough texture by adding flour a few tablepsoons at a time or more milk. You want the dough to pull away from the sides of the mixing bowl and eventually become supple and smooth. Turn it out onto a floured counter-top, knead a few times (the dough should be barely sticky), and shape into a ball. Punch down the dough and roll it out 1/2-inch thick on your floured countertop. With a 2-3 inch cookie cutter, stamp out circles in the dough . Transfer the circles to a parchment-lined baking sheet and stamp out the smaller inner circles using a smaller cutter. If you cut the inner holes out any earlier, they become distorted when you attempt to move them. Cover with a clean cloth and let rise for another 45 minutes. Bake in a 375 degree oven until the bottoms are just golden, 8 to 10 minutes - start checking around 8. While the doughnuts are baking, place the butter in a medium bowl. Place the sugar and cinnamon in a separate bowl. Remove the doughnuts from the oven and let cool for just a minute or two. Dip each one in the melted butter and a quick toss in the sugar bowl. Eat immediately if not sooner. Makes 1 1/2 - 2 dozen medium doughnuts. 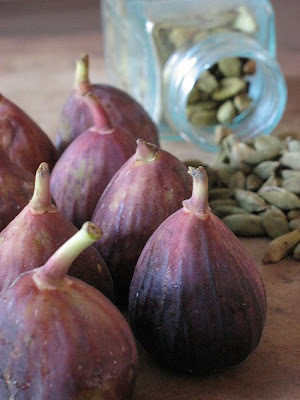 - as Heidi suggests, it is best to do them the day you plan on eating them and not too early. - remove them from the oven before you think they are done, they will continue to bake a little. - make sure the holes in the middle are cut out pretty big as the donuts contine to rise as they bake and tend to swallow them back. - you can make your dough, roll and cut out the donuts the night before and let them do their second rising in the fridge, covered. Set them out on the countertop an hour before baking so the yeast can wake up again....and you by the same time. P.S: Last month I woke up to an early Christmas present: a nice lady named Tammy Wood emailed me with a beautiful collage of my pictures as a banner/header for my blog. She took pity on my attempts at spiffying the blog and "just made it one night"....Turns out she had come here via a common acquaintance, Aimee from Under The High Chair. I was beaming, fidgeting, amazed at her generosity. She is a professional who took the time to help me out, just because....! I quickly put it up and after much internal debate on my part I asked her if it were possible to change the pics to some of my favorites, which she promptly did upon her return from vacation. So peeps, look up, the images are different....I like both but this one is my favorite. Thank you Tammy...It is with people like you that humanity still goes round. I made these to satisfy a craving and to help a family member in need of satisfying hers. I know, it is difficult but I feel I should sacrifice my thighs to help family and friends....! When Sophie came to visit this past month, we tried to make her sample as many local delicacies as possible. We could not get okra and hot sauce to pass her lips but she acquired a taste for tortilla chips, chow-chow, Moose Tracks ice cream, and pecan pies...Yummmm! Of course, as godmother extraordinaire I promised her I would hunt for a recipe in French, using ingredients easily available for her and I would make a batch for the blog so she could get an idea of things to come. While my tree is not quite ready to give me the pecans I needed to come up with a substitute. I was happy to provide her with a recipe and teach her how to make them but we were faced with a couple of problems. It would be difficult for her to find pecans and corn syrup in France to duplicate the recipe. I admit that I rarely use corn syrup when I make mine and I usually substitute maple syrup or honey without a problem. I don't really have anything against corn syrup, I just don't understand the concept of an odorless and tasteless syrup when I can use more flavorful ones. Don't raise your arms up in the air people and scream "food snob", it is just my opinion, my palate, my tastebuds! The extra boost of flavor after that first bite is really something! As far as the pecans, I told her not to worry if she could not find them easily back home and that walnuts made a great substitute. Since I made them a couple of days ago, I have tried them again with pine nuts, pistachios, cashews and I am happy to report that each nut bring an new dimension to the tartelettes (or tassies as they are often called). 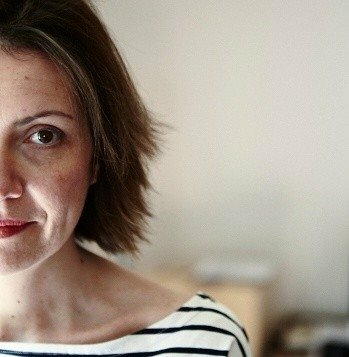 Since I found this recipe on a French blog, La Petite Cuisine, written by the lovelie Elodie, I will provide the measurements in grams but feel free to convert using this site. Like her, I usually use a shortbread crust for nut pies. They are already quite rich so why not continue with the idea and make them even richer?! 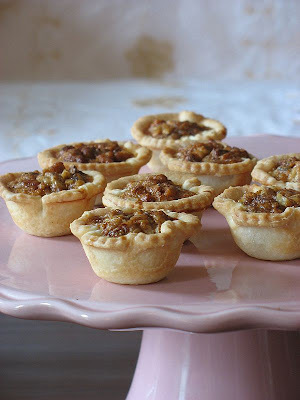 Walnut Honey Tartelettes, adapted from La Petite Cuisine. Makes 4 4-inch tartelettes, and 8-10 mini tassies. In a food processor, pulse all the dry ingredients. Add the butter and pulse again. Add the egg yolk and pulse until the mixture comes together in a ball. Wrap in plastic and refrigerate while you prepare the filling. Roll between sheets of plastic wrap and cut out circles larger than your tart shells, fit the dough into the molds and cut out the excess. Set them on a sheet pan and bake at 350 for about 10-15 minutes or until golden brown. Because the dough has a tendency to puff up, I take the shells out halfway through the baking process and pat the bottoms flat with the back of a spoon. In large bowl, whish the eggs with the brown sugar an the honey. 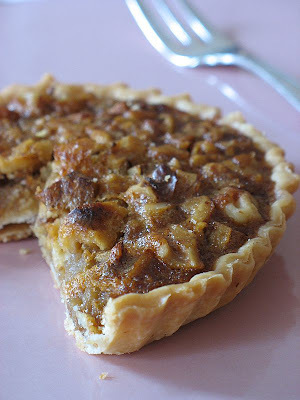 Add the melted butter.Divide the walnuts among the tart shells. Slowly pour the filling over the nuts, trying not to move them around too much. Bake at 350 for about 20 mits or until deep golden brown. I know I liked them a lot...I ate a obscene number of the mini ones but in an attempt to be completely fair for Sophie, I had B. and the neighbors try some and they all approved of the honey/walnuts combo. So go ahead dear and have fun! In the meantime, I am taking a fresh batch to Lisa's and Ivonne's Festa Al Fresco coming up on September 3rd...what are ya'll bringing? !